Dimore Studio Poltrona 008 chairs, Michael Anastassiades Mobile Chandelier, Marcin Rusack coffee table and Eric Roinestad vessel. 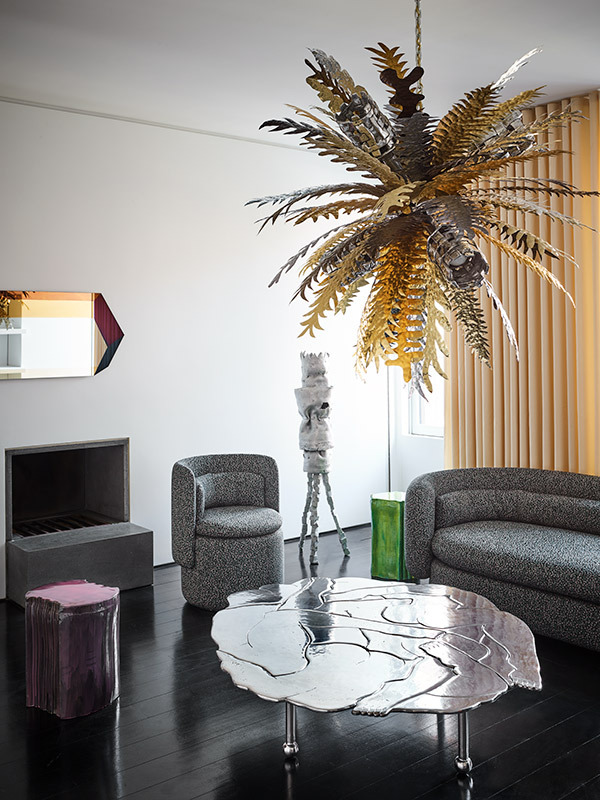 Collection Particuliere Sofa, Marcin Rusack coffee table, Ryosuke Yazaki sculpture and Michael Anastassiades pendant. Welcome to Casa Perfect, New York, the latest location to spring from the mind of The Future perfect founder David Alhadeff. Like its West Coast partner Casa Perfect Los Angeles, this new location boldly eschews the traditional gallery format in favor of something far more personal and visually exciting. 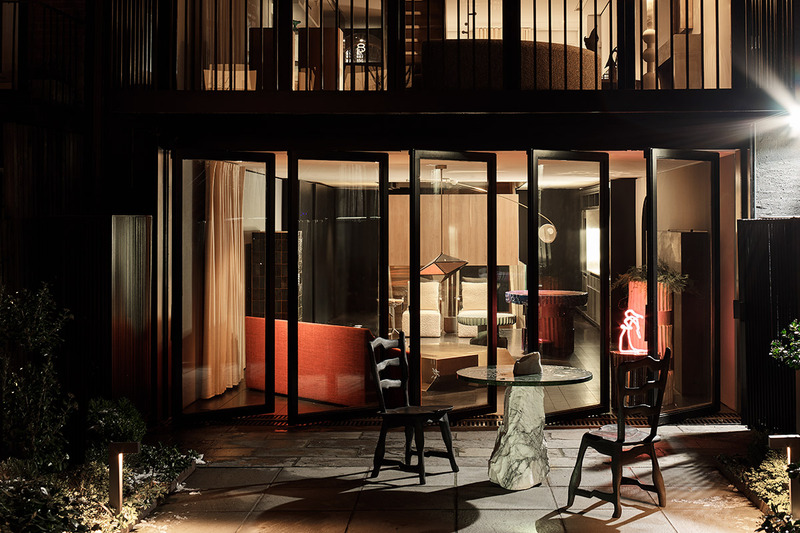 Inspired by the success of the Beverly Hills Casa, the company founder once again dreamed of an environment where the spirit of a house party is never far from one’s mind. Here, by contrast to the traditional showroom format, guests are encourage to linger in a sumptuous environment that’s the antithesis of the look but don’t touch tradition. John Hogan Reflect coffee table, Ben & Aja Blanc Meret Composition, Jason Miller for De La Espada table and chair, Atelier Fevrier rug. 8 St. Luke’s Place, with its views of quaint James J. Walter Park, has always possessed a storied history. Originally built in 1901, the 21' wide townhouse has a magisterial elegance that’s matched by its interiors, which were completed by iconic English architect David Chipperfield for former owner Nat Rothschild. Even though it resembles a traditional fin de siecle structure, the residence, once inside, actually feels far more loft like (on account of its erstwhile owner’s request of a bachelor pad with a single bedroom for the five floor home). 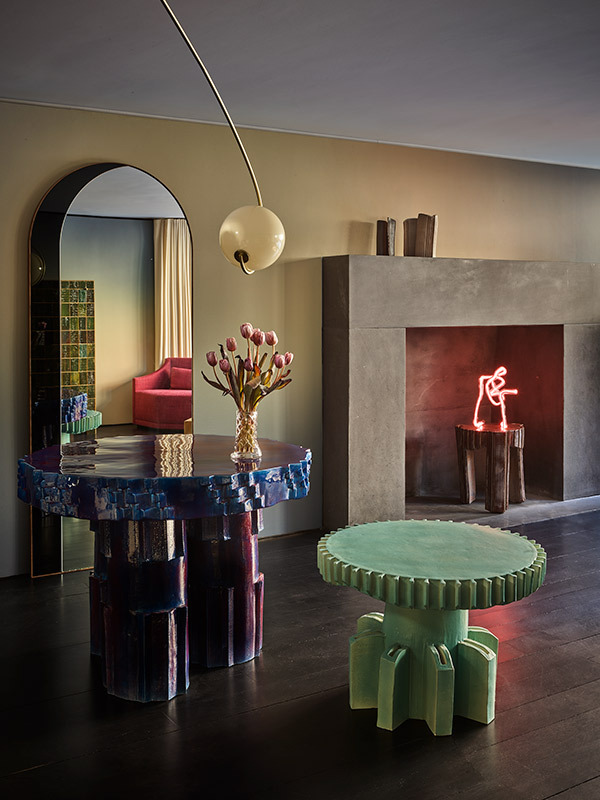 Floris Wubben ceramic tables, Bower Arch Mirror. 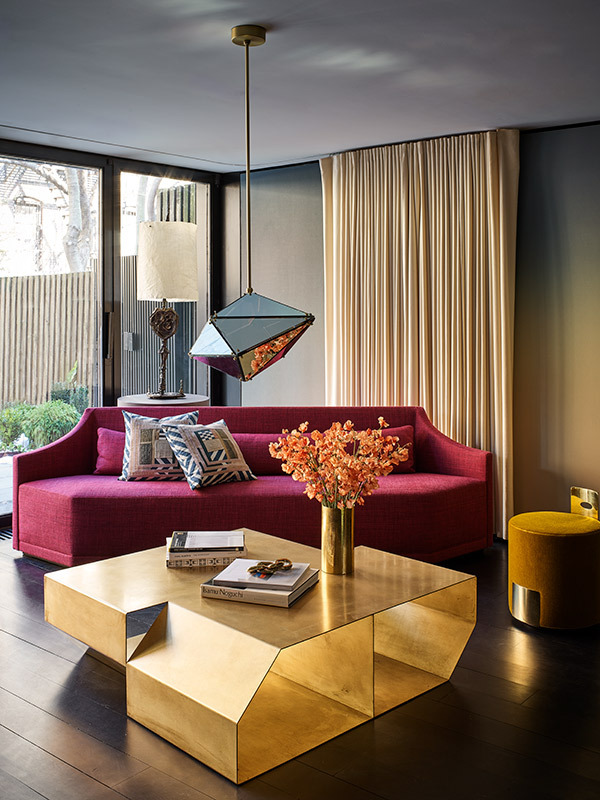 Marta Sala Editions Inge Sofa, Bec Brittain Maxhedron pendant, Christopher Stuart Chamfer table. Architecturally speaking, much of the visual focus gravitates around the spectacular staircase Chipperfield designed as a kind of anchor to the soaring space. 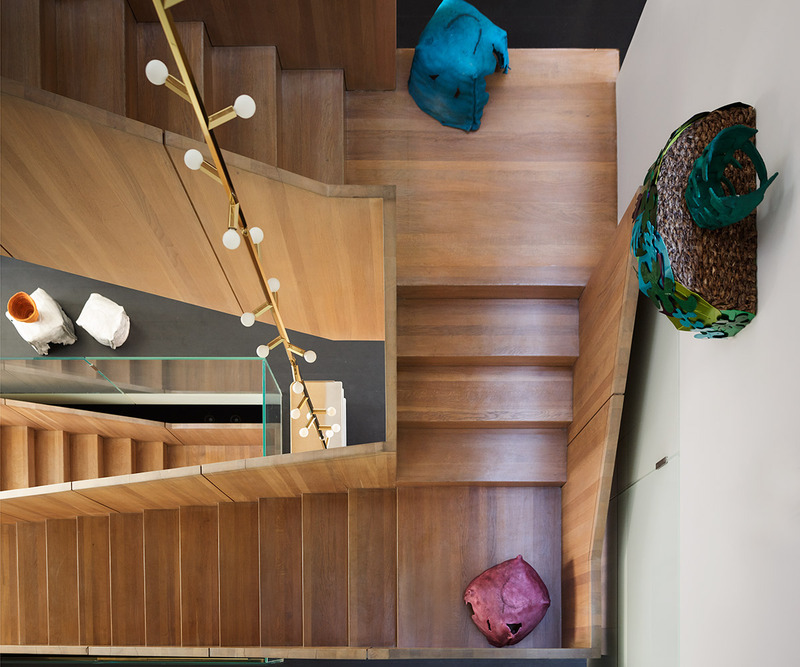 Unfurling upward like an elegant ziggurat, the one-of-a-kind staircase, clad in honeyed English oak, connects the floors of the Casa and is perhaps the one nod to convention in its atypical layout. David Chipperfield staircase with Chris Wolston stools and shelves and Charles de Lisle Linden Chandelier. 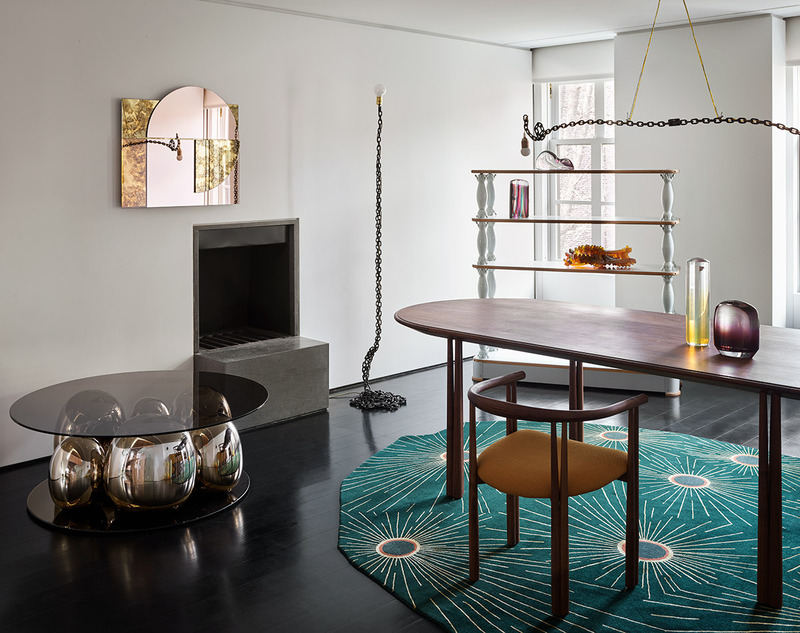 This unorthodox configuration - a townhouse recast as a baronial loft - gives Casa Perfect, New York, the feeling of a light-filled loft, where rooms feel gently interlinked; a forum that allows for the best possible display for furniture and objects. Among these are seminal pieces from the Future Perfect’s noted gallery program including such talents as Eric Roinestad; Ryosuke Yazaki, Floris Wubben and Chen Chen and Kai Williams. 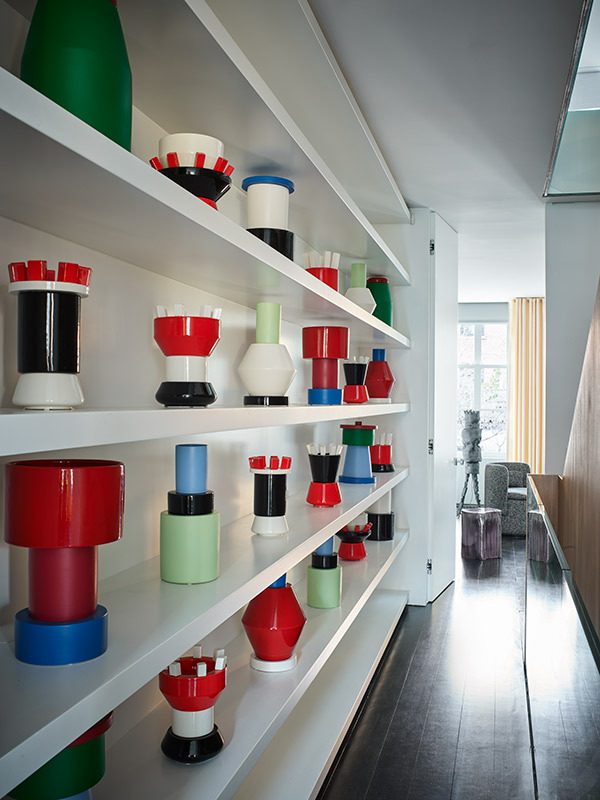 George Sowden and Nathalie du Pasquier ceramics for Memphis Post Design. Chris Wolston chandelier and coffee table, Phillipe Malouin for SCP group sofa and chair. 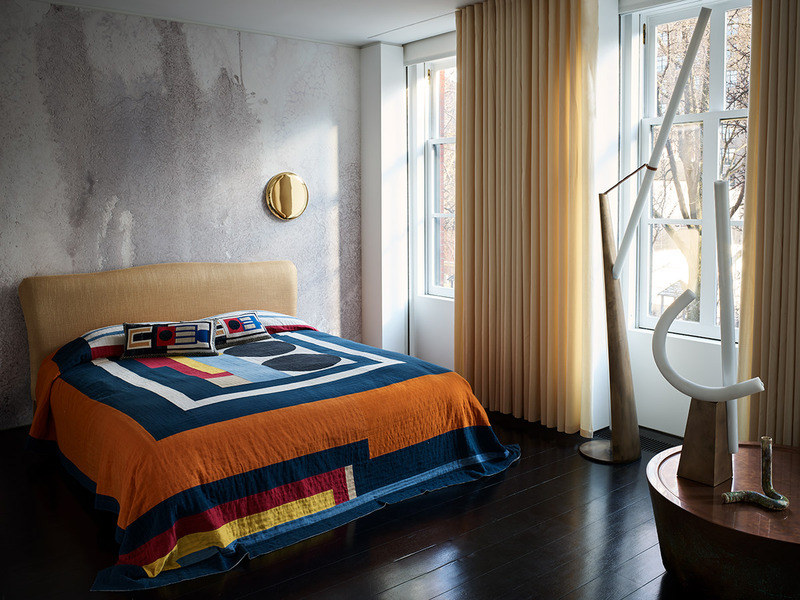 Pinch Moreau Bed and Bec Brittain Krane floor lamp. 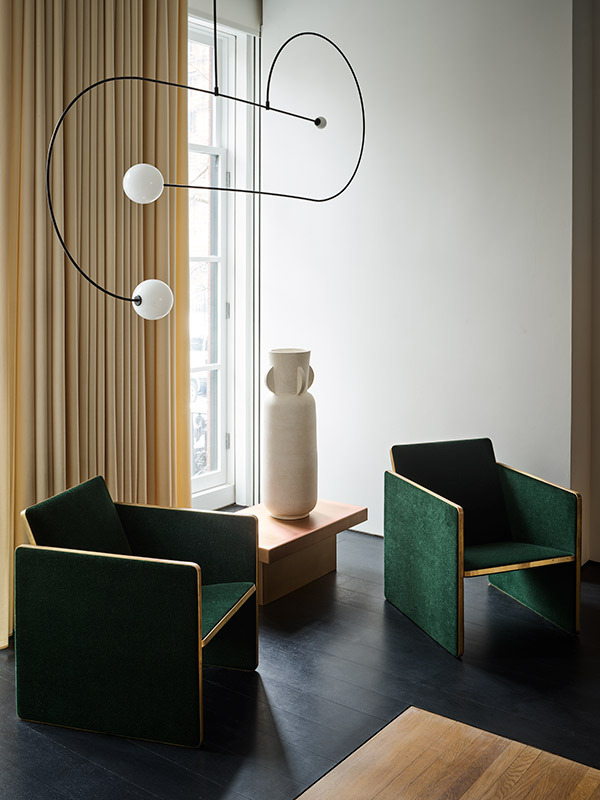 Complementing some of the younger talents are exquisite pieces by more established studios including European juggernauts like Marta Sala's Éditions, Collection Particulièr, Michael Anastassiades and Dimore Studio. Alhadeff has created the kind of destination where one never wishes to leave and there’s plenty to admire; whether one’s shopping for up-and-coming art driven work or undertaking a top-to-toe renovation of their uptown pied a terre. Thankfully, one need not receive an exclusive invitation to this special West Village address - the Casa is open by appointment, come one, come all.